At Engels Jewlery Company, We Create Our Own Custom Jewelry Designs. 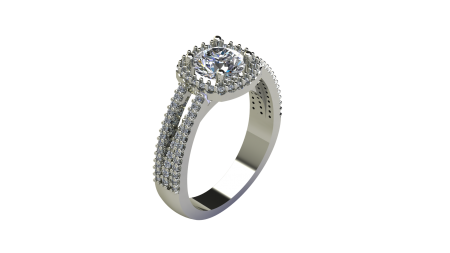 All of Our Rings Are Created In-House Using the Industries Latest Technology, Including CAD Design and 3D Printing. Our Skilled Jewelers Finish it By Hand-Setting the Gem Stones and Precision Hand Polishing. Sparkles, Fire and Brilliance!! This Ring is a Showstopper! Three Rows of Over 100 Diamonds All Hand Set by Our Master Goldsmiths. Then to Top it All Off is the Diamond Set Halo Surrounding Your Choice of Center Gem Stone.